Brothers Hans and John Goering arrived in Hardin, Montana around 1921. They owned and operated the Goering Meat Market and slaughter house. The large room features the original winch and as you follow the rope up to the ceiling you will see the gambrels, which were used to hang the meat. The small room has been restored to resemble Goerings downtown meat market. The slaughterhouse was donated and moved to the museum site in 2000. Camp Custer Cabins were built in 1927, just east of Hardin on the old “Custer Hiway”, by Jake and Pearl Linthacum. 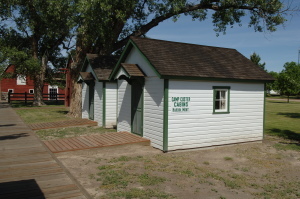 The facility featured all the modern day necessities – four small cabins, office/restaurant combination and a washroom/shower house. The Linthacum’s owned the motel for fifty years. The cabins were saved from demolition and moved to the museum in 2001.